When you look at the business failure rate of SME it is alarming. The statistics say that over 50% of small businesses fail within their first 5 years. That is a very high rate of failure – something no new small business owner wants to experience when they incorporate their business. Opening a company is a tough endeavor to undertake, which is why new business owners need to gain insight about what it takes to develop a successful business. The best insight that can be given to any new business owner is the mistakes that have been committed by other entrepreneurs. These valuable lessons will help you avoid the common pitfalls that lead to business failure. But, in order to succeed, you need to read these common mistakes and understand them. It is frustrating how many new entrepreneurs know about mistakes other business owners have made, and still make the same mistakes themselves. This is because they tend to get so caught up in the moment of building their business that they do not stop to examine this development in its process. By the time the realize something is wrong, it is too late to reverse the actions they have previously done. You do not want to be in this situation. This is why we have compiled a list of big mistakes entrepreneurs make. 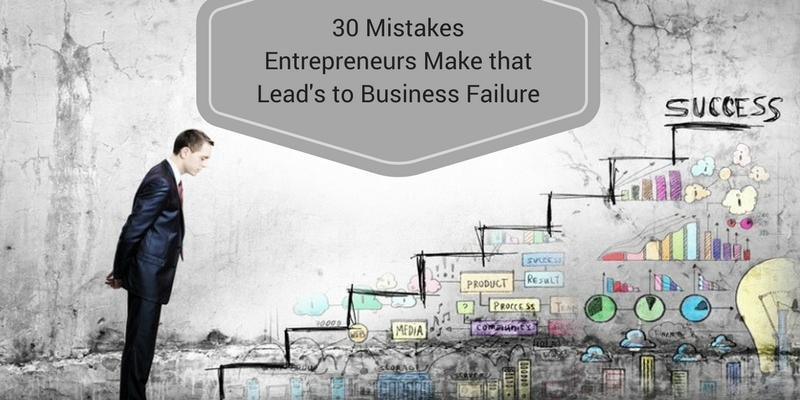 Let’s begin to cover the 30 terrible mistakes entrepreneurs make. People often overlook developing the foundation of their business in favor of doing the more exciting activities. But marketing and sales cannot be performed if your business has not built the foundation to support those activities. Where are your marketing campaigns directing people? How are you closing the sale once interest has been established. You cannot bring your business to the attention of people if no follow through can occur. Not only is this embarrassing, but it is almost impossible to get a second chance to make a good impression with people. Therefore, you need to get it right the first time by ensuring that you build a strong foundation. Get your website in order, develop your processes, have support in place if needed, and make sure your products or services have no deficiencies. Many aspiring entrepreneurs get so infatuated with the lifestyle of successful entrepreneurs that they forget their results were produced from hard work. There is no shortcut to success. You will need to work extremely hard and sacrifice personal pleasures in order to build a successful business. If you want to be a millionaire in a month, then starting a business is not something you should be pursuing. It is a process to get to that level of financial success — if it is even reached. You need to be patient and focused on delivering the best product or service before you attain such goals. You cannot make decisions only thinking in the moment when they will affect your business in the long-term. For example, you take $10,000 upfront selling the rights to your software, and the buyer ends up making millions off of what you built. You got pennies based on the actual value of your software. You cannot take this decision back and now you are looking foolish and in need of money again. This is why it is very important to think about your long-term vision before making any business decision. You are always literally one decision away from leading your business towards failure. Social media platforms are a great tool to use to build your following and let people know about your business. But, it is not the tool that we should be depended on to turn followers into customers. Social media is only the gateway to bringing people into your sales funnel. Email marketing is how you convert interest into actual customers. Social media should only be relied upon for building your traffic. Email marketing is how you generate money through your online marketing activities. If you are not utilizing email marketing, then your business is not bringing in the money it could actually be generating from being online. Here is a secret you should know. All the six figure and millionaire online entrepreneurs rely on email marketing to make their money. Most consumers do their online researchers for a business from their phones. This is also how they prefer to make their purchases. If your website is not designed for mobile users then that is the potential business that you are losing. When consumers see that your website is not mobile-friendly, they abandon it because it does not meet their preferences. You must cater to the preferences of the consumers if you want to remain in business. If you do not have a mobile-friendly website, then it is almost certain your competition does, and their online business is doing great as a result. Many aspiring entrepreneurs take the advice of “follow your passion” too seriously. You can be passionate about something but be horrible at operating a business around that passion. Passion means you love doing one particular thing. A business means you will have to do many things you do not love in order to make a profit from your passion. This means you will have to do marketing, sales, customer service, and administration task. All things which you do not particularly like, which is why your business ends up failing. If you are not passionate about building a successful business, then you should not pursue starting a business just because of a passion you want to pursue. Building a business is a process of many different functions and not just your passion. Thinking that everybody is your customer is one of the worst mistakes many business owners make. Everybody is not your customer because everybody does not need your products or services. Therefore, you need to create a customer profile that helps you quickly identify if the person you are talking to has a real chance at becoming your customer. If they do, then you nurture them further along in your sales funnel. If not, then you move on. Never try to force someone to become your customer. If they do not fit your customer profile, the effort of trying to convert them into a customer will be a waste of time. The most successful entrepreneurs have mentors and coaches who help them get to the next level and avoid mistakes they have made themselves. Mentors provide valuable insight about how to create a successful business based off of the knowledge and experience they have gained over the years. You need these people in your corner to advise you about important decisions you plan to make and introduce you to other people who can help advance your business. The connections you make as an entrepreneur are valuable relationships that can move you further along than your competitors who have not established these types of relationships. It is very important for an entrepreneur to guard the amount of time that they give out. Wasting time is opportunity for your competition to gain an advantage over you. This is why it is very important for you to focus your time on constantly improving your business. You must be strict with your time if you want your business to be successful. This is to not say you cannot have a personal and social life. But, if you want your personal life to be great, then you need to dedicate the majority of your time to creating a successful business that enables a successful lifestyle. When you make the competition personal, you try to completely destroy the competition by any means possible. Yes, in business you are supposed to compete for market position, but that does not mean you take drastic measures in order to win. Trying to destroy the life of your competitors means that you are obsessing over the wrong thing, instead of being focused on having the best business. In order to create a successful business, you need to know how to ask questions that lead to you discovering how to better serve your customers. Struggling businesses incorrectly assume they know what their customers want. Successful businesses are always asking their customers how they can improve their products and services. Ask the right questions if you want to build a successful business. Just because you have a lot of traffic coming to your website, it does not mean that traffic means money is being earned. You can have a lot of traffic and a high bounce rate. This means people are coming to your website but they are leaving it immediately. If you do not have content that makes your traffic stay on your website, then your website is not a valuable asset. People who visit your website need to be signing up to your email list. They also need to be making purchases. Therefore, you need to have great content with call-to-actions that direct people to do both. Otherwise, a large amount of traffic means nothing if your website is not a cash-generating asset. People tend to let their attention get taken away from doing work because that is boring. They instead focus on fun things like socializing on social media, categorizing this as building their audience. If what you are doing does not lead to money being generated for your business, then you will soon find that your business is failing instead of moving forward. You cannot allow distractions to take your focus away from your business. If your mind is becoming tired, take a 15-30 min break and get back to work. Being distracted all the time will soon find you out of business. The main objective of operating a business is to generate money. You do this by providing value to your customers. If you are wasting time on anything other than this, you are focused on the wrong thing. So what you have a lot of Facebook and Twitter followers. Are these social media followers customers of your business? If the answer is no, you have wasted your time on something that is not even making you money. Time is money. Spend your time on making money. Criticism is information being provided that helps you improve your business. If you are avoiding criticism, then you do not want to ensure that your business is providing your customers with value. If being told that what you are doing is wrong, then being a business owner is not what you should be pursuing. You need to have tough skin, and know how to see criticism as feedback in order to build a successful business. The internet has made it where there is no need to ask for permission if you want to get something done. If you want to create a product or service then you can just do it on your own. When you see opportunity pursue that opportunity. Do not wait for the perfect time or ask family and friends if you are making the right decision. Either you are going to take risks and succeed, or you are going to live a safe life full of regret. If you are not willing to invest in your business do not expect for it to make you much money. You need to spend money on improving your products and services, and making your processes more efficient. It is very dumb to take the money you make from your business and spend it on improving your personal life, while your business is not doing great. Reinvest the money your business generates back into your business if you want it to provide you with a freedom lifestyle. Just because you made it does not mean your audience will purchase your offer. Do not depend on assumptions. Instead you need to gather actual facts before moving forward with your idea. Ask your customers would they buy the product or service your are thinking about producing. Ask them what features and the value that would need to be provided in order for them to make a purchase. This helps you avoid a situation where you make a product or service that is dismissed by your customers. The content you provide is how you turn visitors of your website into leads. But, this cannot occur if you provide horrible content. It is even worse if you have good content but its structure turns people away. You should not have long paragraphs. People will not read them. Make your paragraphs 3-4 sentences long. Have bullet points. Bold important sentences. Make your content attractive if you want it to be read. Education never ends when you are a business owner. There is always something to be learned. The moment you stop learning is the moment you allow failure to come into your business. Successful business owners know that you must constantly improve themselves in order to remain competitive. This will help you provide the best value to your customers. If your social status does not affect the amount of money that you are bringing into your business then it is not worth the effort you put into building its size. You can have 20,000 followers and not one of them is your customer. Another person can have just 1,000 followers, but over 80% of those followers are their customers. They operate a million dollar business, while your business is struggling to get by. Focus in what actually matters. Your mindset influences the actions you take. You cannot have great strategy that is backed up by a negative mindset. It will not work. The results you produce will be reflective of your mindset and not your strategy. Think negative and produce negative results. Think positive and you produce positive results. You need people in order to operate a successful business. This means you need employees, customers, and a network of contacts. Therefore, you must focus on developing and keeping great relationships with all these people. The moment you believe you are above any of these people is the moment you set your business up for failure. Appreciate all the people who support you and your business. Networking does not mean that you pass out your cards to everybody in the room without engaging in conversation. Not only is this annoying but it shows that you do not know how to network. Networking means you find out how you can provide value to the person you are talking to. It is about creating a mutual exchange of value in order to develop a mutually beneficial relationship. Social media is a great tool to build your brand, but do not become too dependent on these platforms. So many entrepreneurs spend so much time on social media, that they do not focus on building their businesses. Give social media only a limited amount of attention. You need to be focused on improving your business, rather than your social media reputation. You became an entrepreneur to follow your own vision, and not the vision of others. People will always be presenting you with their great ideas, distracting your attention away from your business. If the opportunity being presented does not further your business, then you need to turn it down. You only need to listen to the advice of people who can help you become a better business owner. So many people will tell you what you should and should not being doing, but they do not have any experience in what they are talking about. These are usually people who do not want you to become more successful or people who want to be known as an expert when they have no knowledge or experience to support their claim. If a person has shown that they have no respect for their position as an employee then you need to fire that person immediately. This should not be an emotional decision that makes you question if you are making the right choice. This is about business. If that person is having a negative impact on your business, then they need to be let go before they cause serious damage. There will be people who read this entire post and still make the mistakes that were discussed here. It just shows you that some people are not focused on building a successful business. They just want to be known as an “entrepreneur”. Rikvin helps you build your business at every stage. We provide an easy path to Incorporate in Singapore along with other services like Immigration, Tax and Accounting and all business support needed to get going.